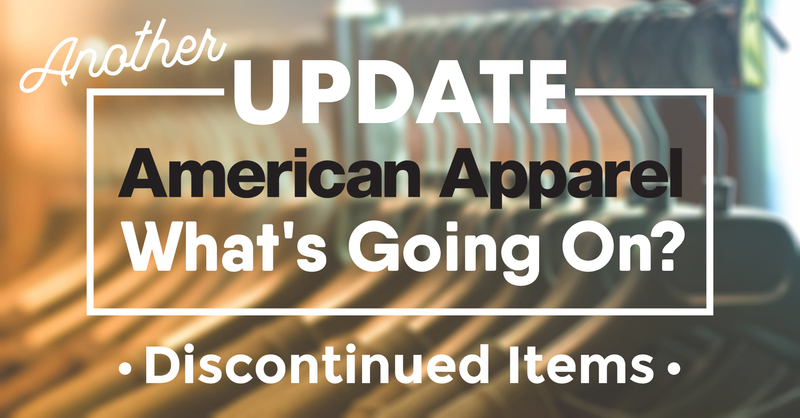 Before we get started, if you've missed our first few American Apparel Update blogs, take a read to get caught up! American Apparel - What's Going On? Update: American Apparel - What's Going On? To quickly summarize, American Apparel was bought out by Gildan, a Canadian based apparel company. During this acquisition period, we were unaware of what would become of the once exclusively American Made company. We hypothesized that the company wasn't going anywhere, but that all the items may not be "Made in America" anymore. Our instincts were right. We've finally been given the run down of what is going on with American Apparel! Gildan will continue to manufacture some (10 to be exact) of American Apparel's products in The United States. The rest will no longer be "Made in America". Many of the colors of the American Made items were discontinued by Gildan, as well as some items. We've decided to discontinue these items, as well as the items that are now being made outside of America. These items will be officially discontinued on January 1st, 2018. BB401 - This item is fully discontinued, in all colors and sizes. 2406 - This item is fully discontinued, in all colors and sizes. BB301 - This item is fully discontinued, in all colors and sizes. TR301 - This item is fully discontinued, in all colors and sizes. TR308 - This item is fully discontinued, in all colors and sizes. If you currently offer these discontinued items in your store, please make sure to remove them or replace them before the January 1st deadline. If you were considering offering these items in your store, please refrain from doing so, as they will be discontinued shortly. We apologize for any inconvenience the discontinued items may have caused you. Though much of this was beyond our control, we do understand that the changes will likely cause some extra work for some of our members, and we certainly aren't happy about that. We do have another awesome American Made brand called Royal Apparel. Their items are not just all made in America, they also offer many ECO friendly and organic items. Our sincerest apologies again.